Ohio has definitely gone global. There are ample local resources to help students develop a greater sense of global connectivity and global awareness. Teachers can arrange for class speakers or opportunities to meet people from other cultures from the list below. In addition, many businesses in Ohio participate in global trade and would be willing to speak and collaborate with your students. Ohio has a long list of colleges and universites with global partnerships who would welcome your interest in their cause. Ohio also offers a Global Institute for its teachers during the summer through a grant by the Martha Holdings Jennings Foundation. Having attended the conference in 2011 at Ohio University, I can say first hand that this was a worthwhile event for all teachers interested in embedding global studies into their curriculum. The Gerald H. Read Center for International and Intercultural Education serves as an international and intercultural resource for students and faculty at Kent State, but also provides local schools with opportunities to host international guests through ILEP, International Leaders in Education, Program. This center hosts a variety of free events throughout the year for teachers and students to attend. These programs offer a variety of professional development opportunities for teachers and programs for students. They support and offer many student exchange programs as well as their Bridges to the World Speaker Series. They have a wealth of resources worth checking into. The Center fosters citizen responsibility through cultivation of a global perspective on critical issues affecting our planet and its people through presentations at conferences, community events, and school workshops. The Center also has an Earth Trek Classroom that will travel to your school for an entire day of global fun. The Confucius Institute promotes the expansion of Chinese language instruction through a range of educational and outreach activities for students, teachers, businesses and community members, both on and off campus. The Institute hosts China Week in the fall each year as well as a China Day for students around the Chinese New Year. They also have provided Chinese-English speaking tour guides to accompanying my class to Asia Towne Center and Asia Towne Plaza in Cleveland. The Confucius Institute is a cooperative project of The University of Akron, the National Office of Teaching Chinese as a Foreign Language, Chinese Ministry of Education and Henan University in Kaifeng, China. Hudson International Festival and Partners, including Janet Rhodes. Hudson, a nearby city, hosts an Annual International Festival to celebrate its rich cultural history, diversity, and the varied international endeavors of its citizens. It is an amazing week of activities for all global educators and their students to attend. Janet Rhodes, an instrumental figure when it comes to global awareness, has a Fair Trade store on Hudson’s Main Street. She has spoke to my class on the importance of fair trade and what it means for all involved. This site offers a speakers bureau, a wealth of educator resources, culturally rich workshops, and web resources centered around global perspectives and global engagement. A state program that offers business advice and resources for taking your business global. You can sign up to receive emails about international events and local seminars regarding exporting, trade missions, global statistics and research, and export assistance. This site holds a wealth of information for our International Business students. It also offers exporting opportunities by industry and provides training and information on how to take your small business global. **The above descriptions were excerpted from the various websites, along with my own annotations. 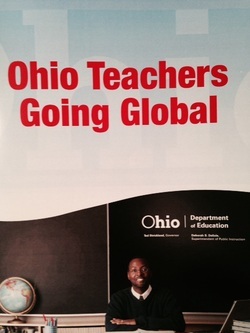 Download the following guide, "Ohio Teachers Going Global", to find more resources for connecting your classrooms to the world.